Occurrences are attendance dates for events within Arena. Click the Occurrences link to view a list of occurrences recorded for this type. The Check-In kiosk application ONLY recognizes the occurrences that are open for specific dates. NOTE: The Attendance column shows the number of individuals that are marked as attended or the head count entered on the occurrence details. In order to take manual attendance, users need edit permission for the applicable module(s), generally found on page ID 1115. 1. From the Attendance tab of a Group or Tag, click the Add New Occurrence icon. Arena creates a default occurrence for the current date. 2. Click the [New Occurrence] link to customize the occurrence. 3. Click the Edit Details button. 5. 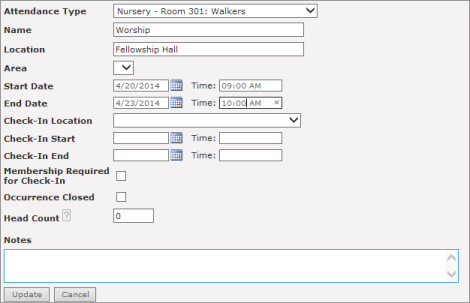 Verify the correct Attendance Type is selected for the occurrence. 6. Enter a Name for the occurrence. 7. Enter the Location for the occurrence. 9. Enter the Start and End Times for the occurrence.